:The Bible - especially the New Testament - has plenty to say about resurrection and heaven, but many Christians struggle to make sense of what it actually means in practice. 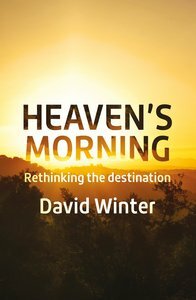 David Winter's accessible book explores the biblical teaching on what happens after death and considers what difference this can make to our lives day by day. The author also shows how we can present what we believe about eternity as a source of hope to our sceptical, anxious world. Canon David Winter is a writer and broadcaster. He is also one of the editors for the People's Bible Commentary series and has written a number of books for BRF including After the Gospels, With Jesus in the Upper Room, Hope in the Wilderness and most recently The Pilgrim's Way. He is also a contributor to BRFs New Daylight Bible reading notes.